Emily starts school tomorrow. Real K-12 school, I mean. With a yellow schoolbus and disciplinary handbook and everything. Jenna started preschool today. Kate and I will get to hang out together while her sisters are away. And I have to go to bed hours earlier than usual (mutter, mutter) just to get everyone where they need to be. A lot of changes. We attended Jenna's preschool conference last week - Jenna stayed with her teachers and new classmates while Kate, Emily and I sat in a meeting room and listened to the director's briefing. It was funny and sad to have Emily sit beside me. This used to be her school a few months earlier. I used to attend briefings for her school year. Now she was this Graduated Older Sibling with Bragging Rights, sitting and listening to her ex-teacher tell other parents what she had already experienced in person the year(s) before. Surreal. The director, as she does every year, requested that parents donate recyclable items that the school uses for crafts. Then she said, "...and if you have a big cardboard box, don't throw it away. I WANT it. We make spaceships, houses, anything. I always believe children learn more by making something than by playing with something bought that looks like it." I wanted to jump out of my seat, run to her and hug her. This is why we love this preschool. But she is going to have to fight me for my cardboard boxes, I'm afraid. I'm not donating them to anyone. They're minemineminemineminemine. We sent a baby picture of Jenna along with her to school today. A print photo. Who has these nowadays, when everything is .jpg files? I had to dig around in our very meager print-photo stash. Found one - and cried. My little Jenna is in school! Yes, hurrah, but.... waaaaaaaaaahhhhhhhh! Oh I am so lousy with transition! But I am excited that the two older girls get to be with new friends they can learn with. I used to be a classroom teacher, and even though my students were much older than Emily and Jenna are, I loved watching how much they could teach and learn from each other. After the baby-photo-weeping-drama, we packed Emily's school supplies in a paper bag to bring to school. Emily was incredibly excited, and then she asked in a small voice, "will you be with me in school, Mum? Will you ride the school bus with me?" How not to cry? How? But I remembered my old students and told her she was going to make new friends, and some of them would be able to do things she couldn't, and some of them wouldn't be able to do any of the things she could. And they could teach each other and learn from each other. But they all needed to give each other permission. So we're going practice asking, "May I help you with that?" and "Could you please teach me that?" And that was why I was so excited for her to go to school. Peer learning is a powerful, powerful source of education - oh the things other families know that we don't! Sort of like Blogland, isn't it? There is, of course, the horrible risk that she could also learn horrible things from horrible friends, but we hope that we have taught her enough to not choose the Path of Horribleness. Sorry this is turning out to be a weird parenting-type post. It will only happen once a year, I promise - and only just before the kids start a new school year. One last thing on educating girls (and boys) - recently, my husband introduced me to the Khan Academy - a very, very cool site of teaching videos. Has physics!!!!!!!! Check out the list. Love it, so thought I'd share. So anyway, we now have two girls in school. Exciting year ahead! I'll still have all three home by lunchtime so we can continue gallivanting around to parks and museums and fabric stores all week if we want to. Some things will stay the same. But for those first few new-school mornings, they 'll have a Happy Girl in their backpack pockets. And their momma's proud smile (before she collapses in a sentimental weeping mess as the school bus leaves, I mean) in their wake. So sweet. I dropped 2 off this morning at preschool. My son is in his second year, but today was my daughter's1st day. Like you I still have one to hang around with and we are all still back to together by lunch. Have a great school year and keep crafting. Emma starts kindergarten next fall - how DO they grow up so quickly?! 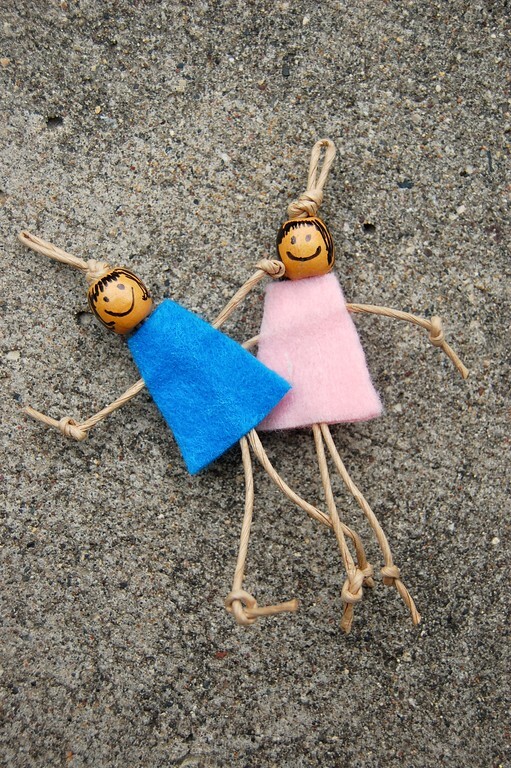 That little doll is adorable, and so simple to make - thanks for the link!